Sheila Hancock delivers an acting master class in Edie, an inspiring tale of strength, courage and refusing to bow down to expectations. Simon Hunter directs the project which sees Edie (Hancock), after a near-lifetime of caring for her spiteful husband, abandoning her life at home after his death. Against the wishes of her demanding daughter, she sets out to climb Scottish mountain Suilven, something that has been a long-held dream of hers. Edie employs the services of Jonny (Kevin Guthrie) who attempts to support her on the gruelling climb ahead. Elizabeth O'Halloran's screenplay may have familiar echoes (see A Walk in the Woods), but the writer manages to put a number of unique and emotive spins on this tale resulting in a watch that empowers and inspires. 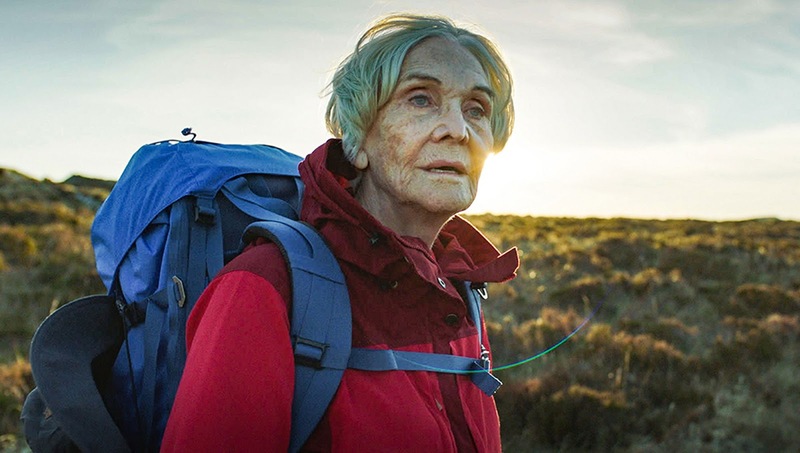 At its heart, Edie is a tale of courage channelled through Hancock's staggering performance. After a lifetime of being worn down by others Edie attempts to fulfil her own wishes by taking on one of Scotland's most formidable mountains. Plagued with doubts in confidence and physical health scares, Edie finds support in Jonny. O'Halloran manages to inject some fun and playfulness into the initially-frosty relationship with Edie and Jonny becoming the unlikeliest of friends with the natural chemistry of Hancock and Guthrie making this feel authentic and endearing. Set against a backdrop of rural Scotland, Hunter and cinematographer August Jakobsson manage to capture a stark beauty in the naturally-beautiful locations. This makes a staggering canvas for this tale to unfold - adding further awe and depth to this already inspiring tale. Jakobsson comes into his own when capturing the climbing scenes when Edie embarks upon Suilven through brutal weather conditions. Hunter directs these scenes with a nerve-shredding tension and uncomfortable thrill capturing the sheer spectacle and skill required to handle this climb. Further wrapped in this tale, is a touching tale about individuality and failing to bow to pressure of small town mentality - beautifully captured in the relationship between Edie and Jonny. Guthrie's performance is touching, particularly as he tackles the mockery he faces from the close-knit rural community. Paralleling Edie's story, Jonny feels a disillusionment in the fact he never followed his dreams and moved elsewhere - yet Edie's story is proof that it is never too late to attempt anything. The heart and soul of Edie is Hancock's towering lead performance. A truly charismatic and skilled presence, Hancock captures Edie's determination and strength in the face of fear and physical constraints. The actress delivers a performance that touches a deep emotional nerve, whilst managing to be simultaneously amusing and gentle. Hancock is sublime.